Today’s salon business is faced with an exciting, and at times daunting, range of equipment that reflects the global influence of technology in the beauty industry. But while keeping your salon current by incorporating the latest technological innovations is a must, when it comes to large purchasing decisions like a piece of equipment, ask yourself these questions to ensure you’re making the right investment for your business. What are the costs associated with offering this service? Salon owners are not only searching for equipment of the highest quality, they are also demanding cost effective machinery with minimal labour requirements. Certain technologies require long and intensive training that can be difficult to maintain if staff turnover is a challenge. Having multiple team members away for weeks of training is also a real cost to your business. If you require a specialist to perform the treatment, how many treatments can physically be performed each week, and will that limit the return on your investment? If you are going to invest a large sum of money into a piece of equipment, you want to be confident that it can pay for itself and generate profit, quickly and easily. Will the treatment provide my clients with the results they want and offer me a competitive advantage? More than ever, clients are looking for easy, pain free and effective treatments they can do in their lunch breaks. You also need to consider whether the treatment you are considering will give your clients the RESULTS that they (and you) are after, with minimal downtime and discomfort. So, when we asked the industry to nominate the most innovative beauty equipment, one that would tick all of the boxes mentioned above, the resounding response was LED. LED Phototherapy is a non-invasive, pain-free treatment that harnesses the power of clinically proven light wavelengths (Blue 415nm, Red 633nm & Near Infrared 830nm) to deliver safe and effective results on a wide range of skin concerns, from acne and ageing skin to psoriasis and dermatitis. Many industry professionals have called it a “cure-all” treatment. But not all LED machines are created equal. There are numerous choices in the marketplace, so if you have decided to invest in LED, you will then need to investigate which LED is best for your business and your customers. While the demand for LED Phototherapy has increased significantly in recent years, it was believed that LED Light Therapy machines could not deliver all three wavelengths at once. But Dermalux founders, Huw Anthony and Louise Taylor, set out to disprove this theory when they developed their own LED system. After working with the best scientists, doctors and LED light technicians in the world, the Tri-Wave system was born. The Dermalux Tri-Wave is the ONLY system that can deliver all three wavelengths at once AND separately, achieving results three times faster and proving to be three times more effective than any other LED machine on the market. The single head of the Dermalux also enables you to target multiple indicators in a single session with no changing of bulky heads. From an investment perspective, Dermalux can boost your revenue by up to 400 percent. Requiring no consumables and minimal labour to perform, the high-tech treatment has the potential to be, by far, the most profitable treatment on your menu. The continued popularity of Dermalux as a results-driven, non-invasive treatment choice is primarily due to its unrivalled clinical efficacy, quality and the safety profile it provides. In fact, the Dermalux LED Tri-Wave has won ‘Best Treatment’ at the prestigious Aesthetics Awards for FIVE consecutive years, (2013-2017). What made you want to put LED in your business? Christine Ewart – The Beauty Spot Swan Hill VIC: As a salon in a small country town, I was tired of hearing clients say that they travelled out of town to have treatments such as LED. This made us determined to take our skin treatments to the next level. Dermalux LED was the non-invasive skin treatment I had been looking for to treat many types of skin conditions as effectively and efficiently as possible. Anita Van Doren – Murrumbateman Wax & Relax NSW: I had witnessed the amazing results LED could provide when I underwent a series of treatments for pigmentation and rosacea myself. When I made the decision to invest in skin technologies for my own salon it was an easy choice to start with LED as it is such a versatile piece of equipment and I already had faith in its effectiveness. Samantha Barton – Blush Boutique ACT: I have a boutique salon that does facials, peels and uses an amazing skincare line, but I felt our treatments needed more. I wanted to take the salon to the next level and I was positive LED would allow that to happen. When researching LED units, what did you look for? Christine Ewart: When I first began looking at LED, there were many units which only offered one wavelength of light – that being red, and you had to purchase different heads to change the wavelength of light. This wasn’t appealing to me as it’s not only costly but seemed time consuming. I was also looking for a machine that was easy to maneuver in our small salon space, in an innovative yet comfortable design for my clients. Anita Van Doren: The decision to purchase an LED machine represented a substantial financial outlay for my country town salon, so I was conscious that I had to ‘get it right’. I was particularly looking for a machine that demonstrated clear, clinically-proven results, was easy to operate and was backed by great after-sales service. Dermalux ticked all these boxes for me and my clients love the results it delivers. Jody Robson – Body Central WA: Efficacy was our number one priority; the machine had to be able to deliver what it claimed it could. We wanted the promise of adequate training and support beyond the machine, yet an LED that would be simple enough for all therapists to use. But most of all, it had to show results! What was it about the Dermalux that stood out above other units? Samantha Barton: Dermalux was like nothing I had seen before. I trialed several brands of LED and Dermalux was definitely the stand out. I love the options to overlay the lights to target more than one skin concern without compromising the results. We are able to do this easily as Dermalux only uses one head, so no swapping light heads! Dermalux is also backed by some of the best case studies I have ever seen from any LED in the market. Jody Robson: During the business research period, I realised quickly that Dermalux was a ‘stand out’ device. Dermalux was the only machine that could offer all three wavelengths simultaneously. This was a huge selling point as it allows us to treat a much larger range of skin concerns far more effectively. It was also the only machine that was pre-programmed to treat an array of skin issues and this reduced any confusion amongst staff as to how to set parameters for treatments. Dermalux also had the most up to date look; it was definitely the most aesthetically pleasing to the eye, plus they also offered great marketing material and training support. Sarah Barber – Headlines Hair and Beauty QLD: It was definitely the three wavelengths in one. 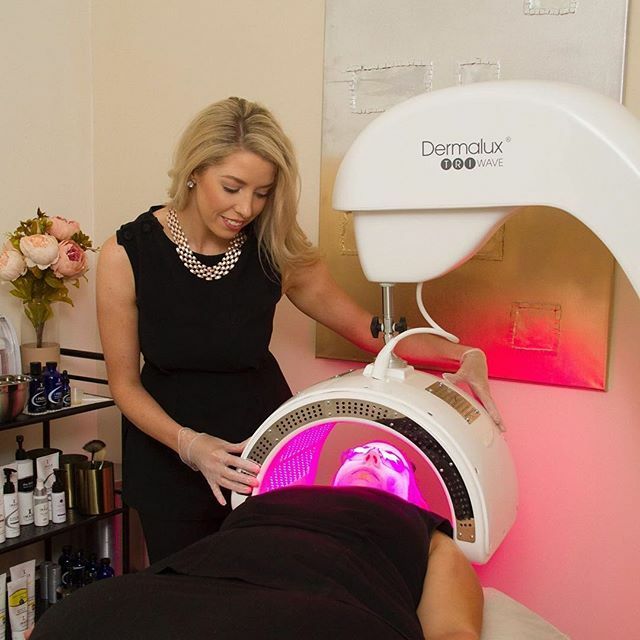 I was also impressed by the multiple industry awards the Dermalux LED had received, plus I felt it was very good value for money - an affordable machine to invest in! How has Dermalux LED changed your business? Michelle Grove – Indulgences Beauty Therapy NSW: Dermalux definitely achieved what I was hoping it would by greatly advancing our skin treatments. We are able to better target our clients’ concerns, and we have had phenomenal results with acne and dermatitis. The results speak for themselves and our clients are hooked! I can say that within five months of using our Dermalux it had paid for itself, making it one of my best business investments so far! Samantha Barton: It has absolutely changed our business! We have become more of a specialty skincare clinic, and every client that has a LED treatment in salon walks away hooked! From a financial perspective, I have never had such a profitable treatment! Dermalux really is a stand-alone WOW factor in our salon. Would you recommend bringing LED into a salon business? Christine Ewart: Absolutely! It is one of our most profitable treatments (only costing 20 cents per treatment). It can even be treated as a “self-serve” treatment, the therapist doesn’t have to stay in the room. The results we have seen in as little as three treatments are amazing. Clients love that it is non-invasive, has no downtime, and can be done in as little as 30 minutes. I would recommend the machine to anyone looking at taking your skin treatments to the next level. Michelle Grove: Yes, I would! This wasn’t the first piece of machinery I had invested in but it has definitely been the best, a real game changer. I would encourage anyone to back yourself and your team, and invest in the Dermalux, you will love the possibilities it offers. Newer PostJoin Janine Tait for Holistic Skincare Training this July!